Jets All Out: How Far Away Are The Jets? How Far Away Are The Jets? 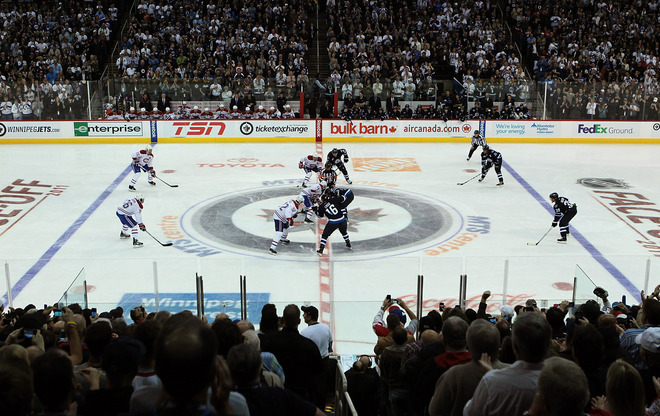 One year in the NHL could be all the difference for the Jets. Ask yourself: How far away are the Winnipeg Jets to being a contender? Or even a playoff team? The Hockey News recently ranked the Jets to finish second last in the Eastern Conference, only ahead of another young, talented hockey team from Long Island. But is that really the standard we should look forward to this season? With the re-signing of Ondrej Pavelec and Toby Enstrom long term, Jets management has made that committment to making sure players who want to stay do stay and for a long term. For both Pavelec and Enstrom, they cited the fans, organization, and present situation as something positive that made it attractive to re-sign in Winnipeg. Not only can that be a positive for the Jets with their own players, but what about other players looking in from the outside? Would this feeling of wanting to stay because something great may be building up at MTS Centre draw other big name free agents in summers to come? Players talk, and likely with Winnipeg having a year under their belt back in the NHL, players will be talking to those involved - i.e. Enstrom and Pavelec. Signing Olli Jokinen and Alexei Ponikarovsky is the tip of the ice berg when it comes to talent that may don the polar blue jerseys at ice level. Back to the question of how far away are the Jets? They may be just a few text messages, phone calls, or face-to-face conversations that could likely make Winnipeg even closer to being a contender. Sorry to contact you via the comments section, but I'm not seeing a "contact" button on here!